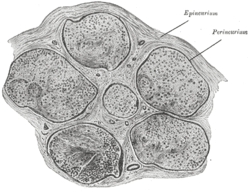 The epineurium is the outermost layer of dense irregular connective tissue surrounding a peripheral nerve. It usually surrounds multiple nerve fascicles as well as blood vessels which supply the nerve. Smaller branches of these blood vessels penetrate into the perineurium. In addition to blood vessels which supply the nerve, lymphocytes and fibroblasts are also present and contribute to the production of collagen fibers that form the backbone of the epineurium. In addition to providing structural support, lymphocytes and fibroblasts also play a vital role in maintenance and repair of the surrounding tissues. ↑ McCracken, Thomas (1999). New Atlas of Human Anatomy. China: Metro Books. pp. 96–97. ISBN 1-5866-3097-0. ↑ Kulkarni, GS (2009). Textbook of Orthopaedics and Trauma. India: Jaypee Brothers Medical Publication. pp. 895–898. ISBN 9350908522. ↑ Payne, Samuel H. (2001). "Nerve Repair and Grafting in the Upper Extremity". Journal of the Southern Orthopaedic Association. Medscape. 10 (2): 1–7. Retrieved 22 March 2015. ↑ Saladin, Kenneth (2014). Anatomy & Physiology: The Unity of Form and Function. USA: McGraw-Hill Science. pp. 484–485. ISBN 0073403717. Anatomy photo: nervous/pns/nerve1/nerve1 - Comparative Organology at University of California, Davis - "PNS, nerve (LM, Low)"
Anatomy photo: nervous/pns/nerve2/nerve1 - Comparative Organology at University of California, Davis - "PNS, nerve (LM, Medium)"
This article is issued from Wikipedia - version of the 4/26/2015. The text is available under the Creative Commons Attribution/Share Alike but additional terms may apply for the media files.